We’d love your help. Let us know what’s wrong with this preview of In a Time of Monsters by Emma Sky. To ask other readers questions about In a Time of Monsters, please sign up. Encouraged to read this by Emma Sky’s sharp analysis in BBC radio interviews of the unintended consequences of the Iraq War, I realised too late that to find out more about her role as political advisor to the American commander General Ray Odierno in its aftermath, enabling her to give damning evidence at the Chilcot Enquiry, I should have started with her book “The Unravelling”. “In a Time of Monsters” proves as is often the case with travel books to be very anecdotal and episodic, often reveal Encouraged to read this by Emma Sky’s sharp analysis in BBC radio interviews of the unintended consequences of the Iraq War, I realised too late that to find out more about her role as political advisor to the American commander General Ray Odierno in its aftermath, enabling her to give damning evidence at the Chilcot Enquiry, I should have started with her book “The Unravelling”. “In a Time of Monsters” proves as is often the case with travel books to be very anecdotal and episodic, often revealing some telling insights through a chance encounter, but also frustrating, even confusing at times, in what it omits or glosses over. The background history of the Shias versus Sunni is a little too fragmented, while the explanation of the Caliphates from the death of Mohammed up to the recent attempts of Daesh to create a single Islamic state probably comes too late in the book, some two-thirds of the way through. “Bored, bitter and twisted”, with an acute sense of anticlimax and loss of purpose after her return to London in 2010, perhaps even a little traumatised by her experience in Iraq as she suggests most westerners are, she resolves to make sense of events by visiting countries affected by the Arab Spring: Egypt, Tunisia, Syria, Iraq, Turkey, Saudi Arabia, Oman, Kurdistan and so on. Making use of what seems like an inexhaustible network of obliging high level political contacts prepared to engage in boozy debates, Emma Sky has no difficulty in striking up conversations with strangers prepared to chat at length . Perhaps her childhood as the matron’s daughter at a boys’ boarding school gave her the confidence to act with such ease in “a man’s world” and also to embark on risky, physically tough journeys, solo or with a male guide for the reward of seeing beautiful, remote areas, like the mountains of Kyrgyzstan. Skimming along the river on a jet ski, white-water rafting, swimming into caves to scale waterfalls: sometimes, the socialising and exciting activities, seem too much of a digression from the lives of ordinary Arabs. It is no surprise that Emma Sky criticises the US for allowing Daesh (or ISIS) to gain a foothold in Iraq in the anger over government corruption and discrimination against Sunnis following the fall of Saddam Hussein. She also condemns the failure to take early action against Assad in Syria to force him to negotiate. It is perhaps more of a surprise that she is so harsh on Obama, described as “leading from behind” and being too passive. However, she does not really provide convincing evidence that continued use of direct force by the West would have yielded the desired results without unacceptable levels of bloodshed, not to mention resentment over apparent attempts to dominate . She is also very critical of Iran as a somewhat malign and destabilising force, reaching tentacles even to the borders of Israel, but was perhaps unable to make the visit to the country which would assist a clear and more objective analysis. There is a logical progression, in that, being in date order, the visits reflect the passage of events, so that by 2014 Emma Sky is at the refugee camp of Zaatari, close to the border in Jordan, which has become the fourth largest city in the country owing to the flood of refugees from Syria. By 2016 she is in Greece and Eastern Europe tracing the destabilising pressure of Arab refugees pushed out by the devastation in parts of the Middle East. She even visits London to suggest, perhaps too simplistically, that the Brexit vote itself was largely the result of concerns over migration triggered partly by the instability of the Middle East. Emma Sky writes in a fluid way, linking her work and travels around the Middle East with the politics, and wars in the region. She also considers the knock on effects in Europe and the rest of the world. Revealed to the reader is the human side of the Arabs, Muslims, and folk who populate this far away landscape, coming across positively we see aspects of their daily lives and how they are connected to us. We are also informed about the environmental, social and humanity impacts of the conflicts and controlling powers within this diverse and rich region. An engaging, colourful and informative read. There are many facets to this book, we learn about the work that Emma did in the area, which leads in to her travels, meeting people after the Coalition forces have withdrawn. Taking a trip to countries wrapped within the Arab Spring, then the spectral rise of Daesh/ISIS from the ashes of defeated foes. Emma then Follows the march of the refugees trying to escape their destruction by Assad and Daesh, while Europe has a mixed reaction of providing some support as well as total ignorance to their plight, as the over faced flimsy dinghies take their souls to the depths of the Mediterranean. The Russian support of Assad prolonging the civil war in Syria, their airstrikes against homes and hospitals then feeding the mass exodus to neighbouring countries and Europe. The drive of the right wing in Europe, massively inflating the fears of the Syrians moving to their countries and causing them harm, rising and bringing about Britain’s Exit of the European Union. The fracture of the European Union serving Russian ambitions to bring their nation back to the world stage, retaking former Soviet territory. This book really highlights how the conflicts in the Middle East impact the Europeans and do not occur in isolation. As Europeans we are very similar to those in the Middle East, and have a vested interest in peace and freedom for those who live there. Despite some of the focus being on the negative sides, this book holds onto hope rather than fear. Emma has an authentic view as a European who has lived and travelled across the Middle East, uniquely having worked with both UK and US forces as well as the local populace. By the end of the book I have been brought closer to that far away place. We have to brave enough to understand why there is suffering and oppression, remembering that despite a different nationality, these are still people who are not dissimilar to ourselves. This book brings a message of hope, but to bring about a better Europe, the Middle East must find peace. We have to consider the motivations of those who seek or wield political power and be cautious about how they want us to perceive others. 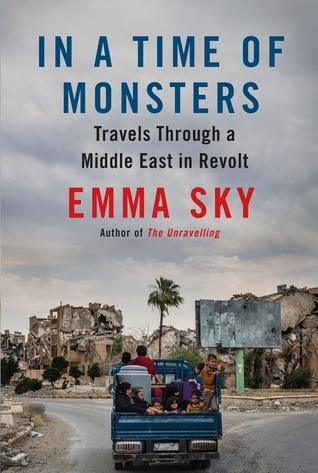 In a Time of Monsters is a fantastic book detailing the stories of Emma Sky, a former advisor to an American General in Iraq, as she travels throughout the Middle East following the Arab Spring. Sky does a fantastic job of describing each country's political situation, going through important points in recent and sometimes more distant history in order for the reader to understand the current situation. As someone not overly familiar with the Middle East, I found her style of relaying informatio In a Time of Monsters is a fantastic book detailing the stories of Emma Sky, a former advisor to an American General in Iraq, as she travels throughout the Middle East following the Arab Spring. Sky does a fantastic job of describing each country's political situation, going through important points in recent and sometimes more distant history in order for the reader to understand the current situation. As someone not overly familiar with the Middle East, I found her style of relaying information to be concise and easy to digest, and she never once strayed into overloading the reader with too much information. While politics, post war rebuilding, simmering tensions and the rise of ISIS were prominent topics throughout the book, this was juxtaposed with various travel stories. Sky vividly describes journeying to see the pyramids in Sudan, Palmyra in Syria and rafting in Iraqi Kurdistan. Her descriptions of her time spent in Kyrgyzstan especially made me want to visit. This book was a wonderful insight into this awful situation and I found it very informative. I had not expected for it to be so well detailed and in-depth with regards to knowledge without appearing biased in anyway. The writing was really good and everythingwas well explained without being too flowery. In addition to this the topics discussed were well explained so rarely found myself googling certain topics. All in all the book was very well written and I found it to be insightful into this is This book was a wonderful insight into this awful situation and I found it very informative. I had not expected for it to be so well detailed and in-depth with regards to knowledge without appearing biased in anyway. The writing was really good and everythingwas well explained without being too flowery. In addition to this the topics discussed were well explained so rarely found myself googling certain topics. All in all the book was very well written and I found it to be insightful into this issue. Although this was only my second book regarding this topic, I would really like to read more non-fiction books on this topic. This was a very well written book and I would highly reccomend to anyone interested on learning more. I read this book in one sitting because it was so captivating. Emma Sky is an inspiring woman who is open minded to the truths of the world. some of the places she went were so dangerous yet she still managed to strike up good and interesting conversations with people from all backgrounds. From the very beginning of the book I was hooked. Emma and her friend are in a bar in Egypt and something very sinister and back door happens all because she was there. My other favorite part of the book was w I read this book in one sitting because it was so captivating. Emma Sky is an inspiring woman who is open minded to the truths of the world. some of the places she went were so dangerous yet she still managed to strike up good and interesting conversations with people from all backgrounds. From the very beginning of the book I was hooked. Emma and her friend are in a bar in Egypt and something very sinister and back door happens all because she was there. My other favorite part of the book was when she spoke of Jo Cox's murder and when she spoke of the London elections which I only knew from a distance so it was interesting to read about from such a lovely woman. I would love to meet Emma Sky one day.